A face with rosy/blushing cheeks, closed eyes and puckered lips. The type of kiss you give to your long-time crush or soul mate when no one else is looking. It's sometimes hard to believe, the person receiving this kiss really is all yours. Pinch yourself all you want, you are not dreaming. Passionate kiss. Puckered lips 2 (more forceful kiss, eyes squinting) old name: Face Kissing. 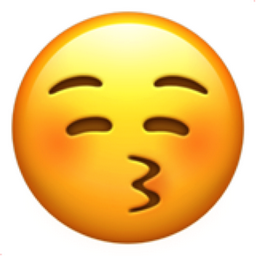 iEmoji old name: Passionate.